I arrive home from a morning ride and at the end of the driveway I see my neighbour Bob sitting in the communal car wash bay with his bike. I let my bike roll on along the pebblecrete, curious to see what he’s doing. It’s a sunny morning with high humidity and Bob sits in the shade on a foldaway pine chair. His bicycle stands in front of him, suspended on a small triangular frame, as he focuses intently on it. As I announce my approach with a gentle ‘ting-ting’ of my bike bell, Bob looks up. He’s doing some maintenance on his hybrid bike. Since having a knee replacement, two and a half years ago, Bob’s been able to ride again. It had been a few years but he has fond memories of riding as a younger man. He used to ride around the Gold Coast in the 1970s on a steel frame Viscount. It was his only means of transport. On one occasion, going on a date meant turning up with two bicycles! Although he was wearing the then Queensland uniform of stubbies and thongs, combined stylishly with a “Jaws” t-shirt, the bicycle ride was just perfect for a certain Danish-born woman. They’ve made a life together that endures still today! Bob rides a couple of times a week. Most rides are about five kilometres but some are 10 or 12 kilometres. He has a few regular circuits that he rides and uses the Runkeeper app to keep statistics on his cycling. Often he rides with his mate George. They load the bikes on the car and drive to Burleigh Heads to ride the esplanade path or to Bilinga to ride the bikeway to Coolangatta. I was curious as to whether they ride along Golden Four Drive between Tugun and Bilinga. The Gold Coast City Council voted against extending the bikeway along the publicly owned beachfront land between Tugun and Bilinga due to the protests of a small number of private beachfront residents. This means cyclists have to ride along the busy Golden Four Drive in a bike lane that is often filled with parked cars or exposed to the risk of door crashes. When I asked Bob if he and George ever ride Golden Four Drive… “oh no, I’ve had too many close calls along on there. We avoid it”. 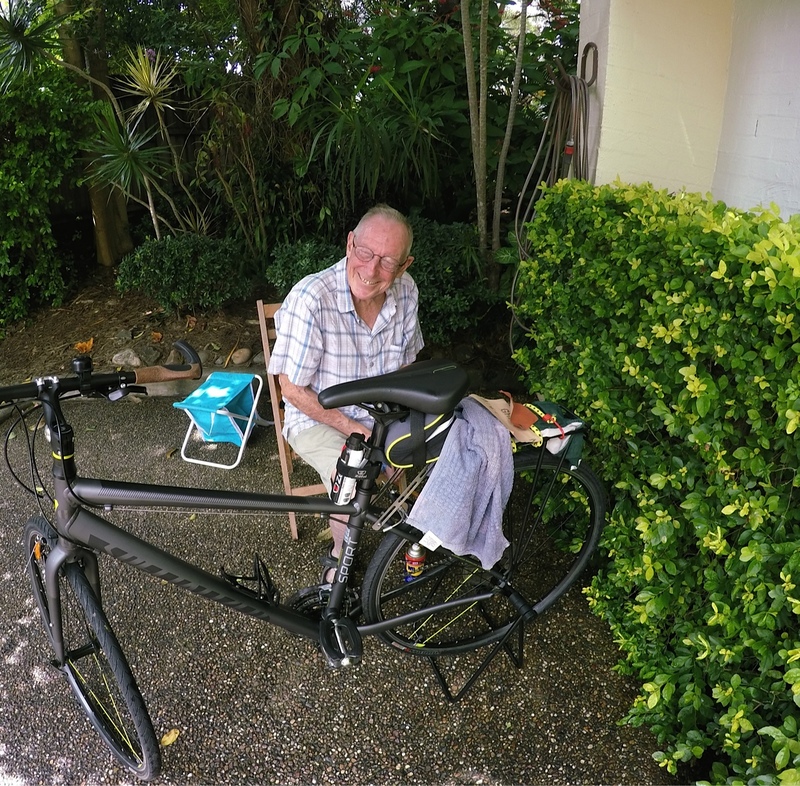 Bob rides his bike for exercise, socialising and the odd errand. I wondered what sort of errands he does. He then told me that last week he cycled over to the Palm Beach vet (about 3kms away) and rode home with three kilograms of cat food – 1.5kg in his backpack and the other 1.5kg on his back luggage carrier secured with a bunge cord! We swap some notes about cleaning the chain and cogs, and about the hazards of sand, salt and rust. His maintenance regime is much more thorough than mine and I end up leaving with a handful of pipe cleaners – those sticks of wire covered in synthetic material to act like a brush – so I can clean the little divots where water pools and rust spawns. It’s a shared joy, bike-riding. Lovely connections made in your ‘hood! I’ll have to ask Bob if he still has it! I love the personal biking stories! Bob’s is inspirational for me in particular, demonstrating how biking can be enjoyed by elders as well. Thanks Robyn! Glad you enjoyed it. Love your bike stories Gail. Maybe, just maybe I’ll get another bike but at the moment I’m enjoying all the walking I’m doing. I doubt that I’ve driven 100km in the last 12 months. I’m so glad people (we) are rediscovering the older, slower ways. You’re right Margaret…bicycle riding and walking both slow us down to a lovely pace that brings the mind a kinder rhythm. Your walking in beautiful Tasmania sounds delightful!